The Rwandan Ministry of Health has sent to Parliament a bill that would legalize the use of marijuana and other drugs for medical purposes, the Rwandan newspaper New Times reported Wednesday. Health Minister Dr. Richard Sezibera, who presented the draft law governing drugs, psychotropic substances, and precursors, said the bill would protect the population. 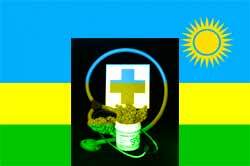 Africa: Rwanda Moves to Legalize Medical Marijuana. "The objective of this bill is to contribute to the protection of the population while ensuring that drugs and psychotropic substances are exclusively available for scientific and medical purposes," Sezibera told the Parliament. The bill complies with United Nations conventions on drugs and responds to the UN's call for every country to have laws against illegal drugs and to control dangerous medications, said Sezibera. At the same time, it achieves the Health Ministry's mandate to ensure that citizens have adequate access to medications, he said. edically, usage of such substances help in relieving the pain and problems related to psychic troubles," said Sezibera. "The medicine will thus be available and correctly utilized." Members of Parliament endorsed the bill without objection, New Times reported. In experiments, a marijuana-based medicine triggered the formation of new brain cells and cut inflammation linked to dementia. The researchers say that using the information to create a pill suitable for people could help prevent or delay the onset of Alzheimer’s. The incurable disease affects 400,000 Britons, with around 500 new cases diagnosed every day as people live longer. For some sufferers, drugs can delay the progress of devastating symptoms such as memory loss and the erosion of ability to do everyday things such as washing. However, there they do not work for everyone and, with the number of patients forecast to double in a generation, there is a desperate need for new treatments. Last Monday, the law regulating clinics in Los Angeles took effect. A steady parade of operators filed into Los Angeles City Hall and paid $324 in application fees, which placed them on a list of clinics that will be notified in a month if they are eligible to continue operating. Elsewhere, however, owners kept their dispensaries shuttered, not willing to take a $2,500-a-day risk by flouting the law. "Sorry! We are closed for the time being," a makeshift sign taped to the locked front door of the Green Joy dispensary in Woodland Hills read. Still, many of the 440 outlawed clinics - those that opened after a November 2007 moratorium took effect - are pinning their hopes on a hearing scheduled for June 18, when a judge will hear arguments on lawsuits challenging the new law. Frank Sheftel of the TLC Clinic in North Hollywood, said there is a lot of uncertainty among clinic operators, even those who are confident they will meet the city's new requirements for operation. "The system is so confusing and everyone wants to make sure they have their application in on time," Sheftel said as he stood in line. Monday was the first of five days in which the estimated 137 clinics that registered prior to the city moratorium can file their request for priority status. At the same time, the City Attorney's Office is developing procedures for the Los Angeles Police Department to follow up on with the more than 400 clinics that have been notified they had to close. It has not been decided whether to pursue civil or criminal proceedings for those that refuse to comply. "We continue to work with the City Attorney's Office on establishing an enforcement strategy," said Capt. Kevin McCarthy of the LAPD's Gangs and Narcotics Division. Police Chief Charlie Beck said the department is waiting to see how many of the clinics comply voluntarily. Gov. Bill Ritter signed into law today two bills regulating and legitimizing the state's medical-marijuana industry. "The companion measures I signed today strike a delicate balance between protecting public safety and respecting the will of the voters," Ritter said in a statement. The bills — which impose complicated licensing requirements on medical-marijuana dispensaries and crack down on unscrupulous doctors indiscriminately handing out marijuana recommendations — were some of the most high-profile measures passed in the legislature this year. But Ritter signed the bills, House Bill 1284 and Senate Bill 109, this morning without the usual public ceremony such attention-grabbing legislation usually commands. Instead, the bills were signed privately along with a slate of 28 various other bills before Ritter headed out on a bill-signing tour in southwestern Colorado. Supporters of the bills say they will professionalize the medical-marijuana industry and make it harder for people to abuse the system. But several prominent medical-marijuana advocates say the rules go too far, will drive marijuana dispensaries out of business and will push patients back into the underground marketplace. A team of lawyers has already begun recruiting potential plaintiffs for lawsuits challenging the laws' constitutionality. Dutch Passion announce partnership with Canadian cannabis producer Weed Me.